Have you ever been in locker room at a pool or recreation center? Not only is the floor extremely slick, it is constantly wet, increasing the risk of bacteria forming. Is there a way to rectify this problem, you ask? The answer: PEM locker room slip-resistant matting. Recently, we installed some High Traffic slip-resistant matting in the Campus Recreation Center locker rooms at Missouri State University. In an effort to create a safer and more comfortable environment, the university enlisted the help of our slip-resistant matting. After a seamless installation, the university began to see results almost immediately. The neutral color blends in well with the surroundings, and the surface provides a safe path for students, faculty and guests. Plus – the antimicrobial formula guards against the growth of mildew, fungi and bacteria. 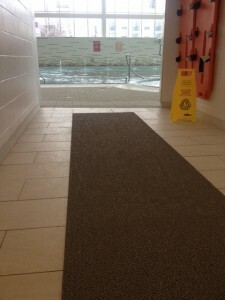 In short, our high traffic slip-resistant matting will help keep the recreation center safe, healthy and comfortable. While our slip-resistant matting might be new to the Missouri State Recreation Center, it can be found in a variety of locker rooms from coast to coast.